The Canadian Mental Health Association (CMHA) is an organization that creates awareness and provides education, advocacy and support for individuals and families living with mental illness, addiction, or a loss by suicide. The Calgary Region of the CMHA was established as an independent branch in 1955, and recently rebranded as YOUTH S.M.A.R.T. (which stands for Supporting Mental Health And Resiliency Together). As part of the rollout for its rebranding, the CMHA asked the team at William Joseph to design the new website for YOUTH S.M.A.R.T. William Joseph worked closely with the CMHA to develop a website that made it easy for everyone to find the information they need. The site was created with a fresh design and modern SEO capabilities and functionality; it is easy for CMHA to maintain on the back-end, and user-friendly for site visitors on the front-end. The CMHA contacted William Joseph in 2014 for help with their Youth Start campaign. 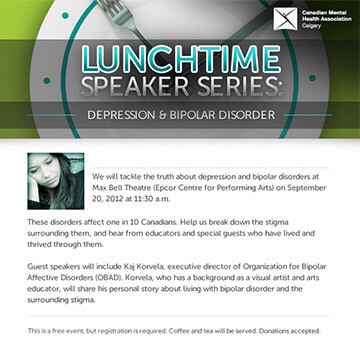 The campaign was meant to bring awareness to mental illness in youth, and remove the stigma surrounding it. Beginning with a logo design, our creative team developed a complimentary brand for the campaign, and applied it across both print and digital mediums. The campaign carried the message of mental health to students across Canada. Beyond the significant reduction in costs associated with distributing this content in a print format, there are numerous benefits that will be derived from transitioning to electronic distribution. This method of content distribution would provide the CMHA the ability to capture and analyze metrics associated with readership and better target the various reading audiences, and allow for the eventuality of segmenting the database to further refine specific content delivery. #WJams - April 23rd, 2018 - "Friday Night Turn Up Tunes"